Some mornings, you wake up to the normal everyday drudgery of writing about videogames. Other days you wake up to a gender-swapped version of the most anticipated videogame story of all time, published by the lead writer as a final farewell to fans. Today is that second sort of morning. Marc Laidlaw has released some “fan-fiction” on his blog, detailing what would have been the plot of Half-Life 2: Episode 3, had he got to make it. It’s pretty wild. 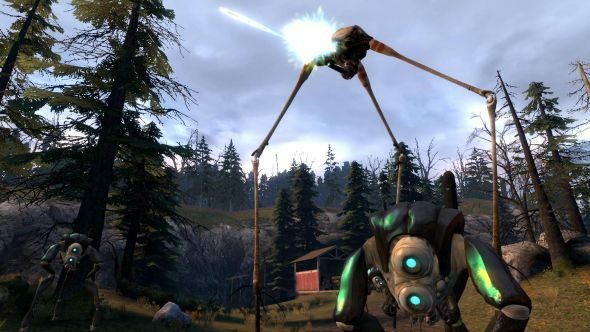 For everything else we know about Half-Life 3, we have a dedicated article. If you’re just here for the links, this is where Laidlaw posted it, you’ll need this archive to actually read it until the Reddit hug stops. There’s also this handy pastebin (via the ever-reliable Wario64 on Twitter) with all the gender-swapping and renaming fixed up. For those who want a quick summary, you bury Eli Vance and get on a seaplane to Antartica. It’s then shot down and you wander through the icy wastes for a while. You eventually find the time-and-dimension-shifting Borealis and manage to board it, fighting through it even as it phases through realities, with glimpses of everything from the Seven Hour War to the far future of the Half-Life universe – even a few of the Combine homeworld. Eventually Alyx and Dr. Mossman (who has been with you, by the way) have a fight and Alyx kills her, because Alyx wants to use the Borealis as a makeshift time-missle battering ram against the Combine and Mossman wants to give it to the Resistance. You go with Alyx’s plan now that Mossman is dead, a suicide mission until the G-Man shows up, saves Alyx and leaves you to your doom. Just as the Borealis rams into what is clearly an indestructible Dyson Sphere you will have zero effect on, the Vortigaunts save you and dump you back into the Half-Life timeline, many years in the future. The end. Please wait for Half-Life 3 but never expect any closure. Oh, also, Breen is a slug. It’s an interesting tale, follows the structure of other Half-Life games, and leaves most of the bigger questions completely unanswered. There is nothing on who the G-Man is, nothing on his relationship with Eli Vance or his daughter. The Combine aren’t defeated, or even really scratched, and Gordon doesn’t say anything. With a little bit of reading between the lines (at least in my opinion) it shows where some of the difficulties in development were. The scenes after the seaplane crashes sound boring and like Laidlaw never really fleshed them out until you reach the Borealis. They’re also in vast icy wastelends, so goodness knows how they’d have worked gameplay wise. Equally, the fighting in and around the Borealis sounds amazing, but technically challenging, particularly back in 2008 when this was still fresh in Laidlaw’s mind and the main thrust of Valve’s development. Then there’s the matter of actual choice in the story, something Half-Life never did before but it looks like Laidlaw wanted to. It’s definitely worth a read, and I didn’t go into all the details in my short summary above. As you can imagine, it’s given part-catharsis, part-frustration to fans wanting answers. As Laidlaw says on Twitter himself, they never would have got them – seeds were planted without any plan of what the trees would look like, and they always wanted to ask more questions than they answered. This probably puts paid to any chance of seeing this in game form – in case the last ten years weren’t enough. At least we got a little closure.